Much research has implied that social capital functions as an unqualified “public good,” enhancing governance, economic performance, and quality of life (Coleman 1988; Cohen and Arato 1992; Putnam 1993; Cohen and Rogers 1995). Scholars of disaster (Nakagawa and Shaw 2004; Adger et al. 2005; Dynes 2005; Tatsuki 2008) have extended this concept to posit that social capital provides nonexcludable benefits to whole communities after major crises. 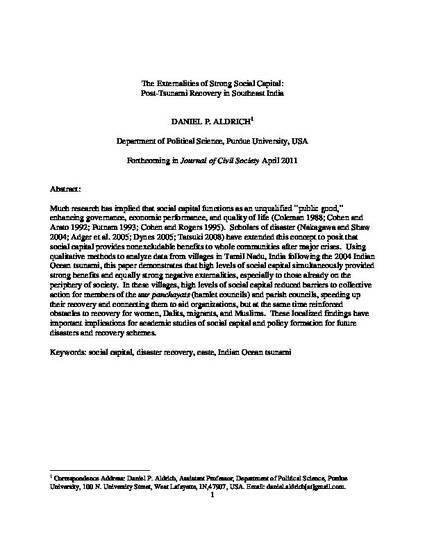 Using qualitative methods to analyze data from villages in Tamil Nadu, India following the 2004 Indian Ocean tsunami, this paper demonstrates that high levels of social capital simultaneously provided strong benefits and equally strong negative externalities, especially to those already on the periphery of society. In these villages, high levels of social capital reduced barriers to collective action for members of the uur panchayats (hamlet councils) and parish councils, speeding up their recovery and connecting them to aid organizations, but at the same time reinforced obstacles to recovery for women, Dalits, migrants, and Muslims. These localized findings have important implications for academic studies of social capital and policy formation for future disasters and recovery schemes.